Hi everyone. So, after working on the last lesson, are you still with me? I hope so, `cause here's the second part of Chopin's Piano Concerto in A minor, Opus No.2. Chopin's mastery of harmony is quite evident in this section. He starts off by modulating to the key of C, the relative major of Am. (This type of modulation became popular during the Baroque period.) After that, the fun begins. Notice the clever way Frederic briefly modulates to the key of Gm-he approaches D7 (the V chord of Gm) chromatically from below before resolving to the actual Gm chord. He then repeats this move a whole-step up, chromatically approaching E7 (the V of Am) before resolving to Am. In measures 12-13, Chopin relies on the tritone substitution principle (in which a dominant-seventh-type chord can be interchanged with another dominant chord a diminished fifth above or below). Notice how Eb7b5 is used as a substitute for A7 (the V of D) and how F7b5 is used to replace B7 (the V of E). This type of move (very common in jazz) only underscores how harmonically ahead of his time Chopin was. In this section, Chopin introduces the appoggiatura-a melodic device in which a chord tone is approached from either a half-step above or below. You can see great examples of appoggiaturas in measures 1, 3 and 5. Notice how, over the C chord in measure 1, Chopin begins the melody with Db (the lowered second) before resolving a half-step down to the "target note," C. He then continues with B, this time resolving a half-step up to C. An identical contour is applied to the embellishment of the D note in measure 3 and the E note in measure 5. In measures 14-17, Chopin forgoes the chromatic scale for the first time in this piece. Instead, he finishes this passage with a series of descending seconds using primarily the A Aeolian scale (A B C D E F G). Again, notice Chopin's precise targeting of the chord tones on the downbeats. Pay careful attention to the left-hand position shifts in measures 12-13. To properly execute these speedy shifts, move your entire left hand to the next position instead of stretching into it with your pinkie or index finger. Refer to the tablature for the proper fingerings. Remember, practice this piece with a metronome. Start slowly-one measure at a time-and work your way up to speed. Good luck with this passage. I know it's tricky, but it's very rewarding once you've mastered it. I'll see you next time with the grand finale. 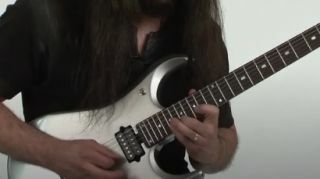 This lesson originally appeared in Guitar World as part of John Petrucci's "Wild Stringdom" column.